Trainer Peter Lagogiane is back for another crack at the Launching Pad. Less than 12 months after Beast Unleashed took home the Launching Pad, trainer Peter Lagogiane is back for another crack at the sport’s only sweepstakes event. The brilliant Beast Unleashed entered the final the $2.70 favourite on the back of brilliant heat and semi-final wins and raced to a memorable all of the way victory in the final, defeating the likes of Dyna Patty, Tornado Tears and She’s Gifted to claim the $150,000 winner’s cheque. Trained at the time by Peter’s wife Jodie, it was the the biggest victory of their training career and there was a huge Easter crowd was track side to enjoy it. “It was a bit of a blur, the night was just amazing,” he said. “We had some friends here, and obviously Dawn (Garrett) the owner, and my wife, my family and some real good friends flew down to Melbourne to support us. And what a night! Beast Unleashed arrived in Victoria with a big reputation and entered the series with four wins from five career starts. To win Launching Pad the way he did was not only a thrill, but a relief. Three-week series can be demanding for both trainer and greyhound particularly for a greyhound so early in its career. The experience Lagogiane gained in last year’s series, coupled with the advice of good mate and fellow trainer Anthony Azzopardi has proved invaluable as he prepares for another tilt at the Launching Pad riches. The one lesson he learned above all others is preparation. “You pick up a lot of things. I know now to plan well before we go to a track. We’re trying to prepare the dogs right, and that’s the best thing I’ve picked up. “We came four weeks out from this series to trial and we were here last week with the dogs where they stayed at Anthony’s place. We try and let the dogs relax in their own comfort, and we also change our feeding a little bit while we’re travelling. Of course, identifying the right dog for the series is also important. 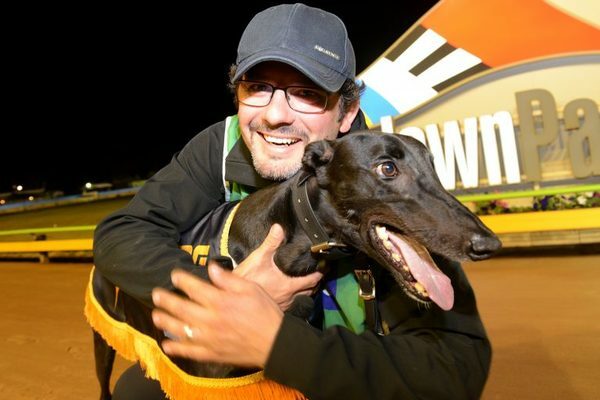 One such greyhound the Lagogiane is hoping will shape up as a Launching Pad contender is Double Back who made his metropolitan racing debut in Thursday night’s final race. “The dogs that’ll show you the first two sections, really, they win the group races. “The dogs that come from behind, well, it’s brilliant to watch barnstorming finishes, but generally 85% of races are won from the first two sections so the dogs show me earlier on in their career that they can run the first two sections and have the maturity, we look for that. There is $432,000 in prize money up for grabs over the three weeks of the Launching Pad. It is open to greyhounds with 1-6 wins and no more than 30 starts, and connections need to pay a $2000 entry fee to book one of the 64 places available. The winner of the fourth race on Thursday night earned a berth in the series as part of the win.